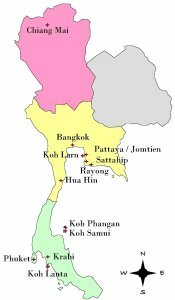 The Kingdom of Thailand is an independent country that lies in the heart of Southeast Asia with Bangkok being its capital. Bordered to the north by Laos and Burma, to the east by Laos and Cambodia, to the south by the Gulf of Thailand and Malaysia, and to the west by the Andaman Sea and Burma, it is the only country in Southeast Asia never colonized by a European power. Click for larger Image ethnically Thai, 14% is of Chinese origin, and 3% is ethnically Malay. The rest belong to minority groups including Mons, Khmers and various hill tribes. There is a small number of expatriates from other developed countries. Although the official language of Thailand is Thai, the level of English proficiency about the Thai people is increasing gradually. Thailand is mainly an agricultural country with a fairly new industry emphasizing on exports and a flourishing tourism industry, the peak season of which is from November to April and in July and August. The official calendar in Thailand is based on the Buddhist Era which is 543 years ahead of the Western calendar, for example the year 2009 AD is 2552 BE in Thailand. 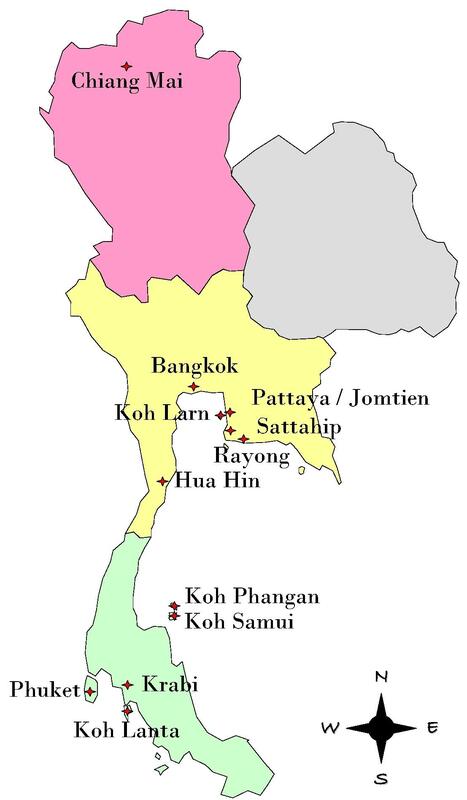 Administratively Thailand's 76 provinces (Changwat) are divided into districts [Amphoe or Khet (in Bangkok)], sub-districts [Tambol or Khwaeng (in Bangkok)] and villages (Moobaan). Pensit & Laws has experience handling numerous transactions in the places marked on the map to the right. Usually there are 16 public holidays in a year however there may be more declared by the Thai government. In the event that a public holiday falls on a weekend, the government usually declares the following working day a compensatory holiday. These days, traditional and modern, are observed but are usually not public holidays.